So, the bump exists. I actually didn't quite realize it until I put on a shift dress. I've been gravitating toward loose clothes, but now that everyone knows I'm preggers (!!! ), I'm embracing it. Unfortunately, to the general public I still look like I ate a giant burrito for lunch, but I think know there is a baby in there so I feel good about the belly. And. This. Dress. I may have wandered into Banana Republic over my birthday weekend even though they don't sell maternity clothes. Actually, I was with my friend Teresa who is more pregnant than me so I don't know what we were thinking. Anyway, they were having an extra 50% off sale styles so I had to look. 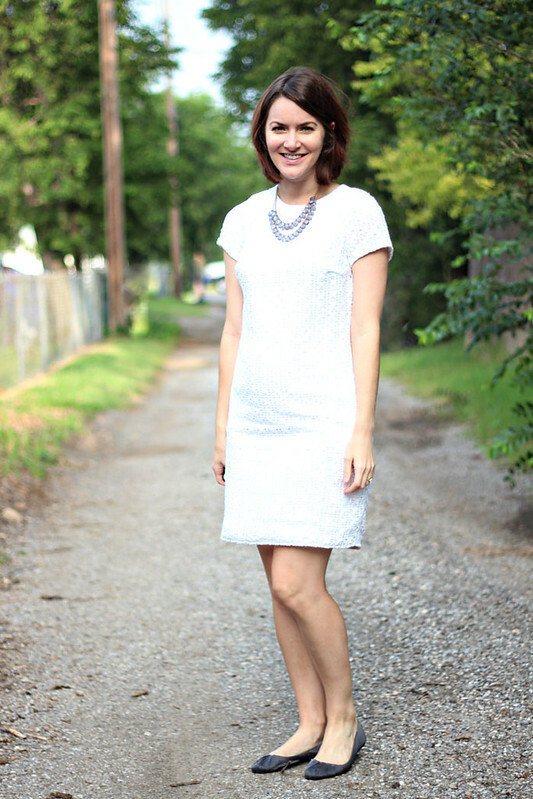 I have been wanting a LWD (that's "little white dress" for anyone who has better things to do in their life than think about white dresses) but I couldn't justify it because, well you can't wear it to a wedding (clearly I don't have enough occasions to dress up). But this, gorgeous dress was on sale for $21 (with the extra discount) and it was a tall size so it was meant to be. I mean, I had to buy it, right? Look at that adorable little bump!!! You look positively radiant! BUMP!!! You are the cutest. This dress is seriously gorgeous as well. I want. I have been searching for a white dress for so.long. but havent found the perfect one yet. OMG! I missed the bump announcement! You look so incredibly chic in this dress - I can't wait to see how you style the bump for the next 18 weeks! Awwwww! Congrats to you! And the bump is SO CUTE! Embrace it, because it suits you so well :) And $21 for that dress, nice! The bump exists! I couldn't imagine seeing the bump and not knowing you were pregnant-- that would be the biggest food baby I've ever seen! I wonder if there is some world record for biggest food baby. Beef sandwiches make me bloat so much, I could pass as being 22 wks pregnant, ha. There goes my theory about your obvious pregnancy. Anyway. You look fabulous in this dress, I'm so glad you got it!! Your bump is so cute! I really like this dress on you. $21 is such a steal, especially considering how good it looks on you! Too Cute ! Hope you and the hubby are doing good ! That dress is so perfect and shows off your tiny bump so well! I love it! And that dress is casual enough you could get away with wearing it to work, especially with a blazer or cardigan. Oh woww!! Congratulations!! You look so cute in this dress!! Look at your little belly! So are going to be one of those adorable pregnant ladies. The dress was a great find. Looking great Ashley, I love how this outfit shows off your bump just so! This dress was such a sweet find. Meant to be, I agree! Oh my goodness you are adorable! Love that dress! What a steal! Ooh, that dress is lovely, and I love how you styled it with gray! Looks so elegant and chic. Such a sweet dress! Embrace the bump! You look great! very sweet look and bump. I actually missed dressing it for the longest time! I am weird. Love your bump!!! and this dress is gorgeous! When it's $21 at BR, you DEFINITELY have to buy it! 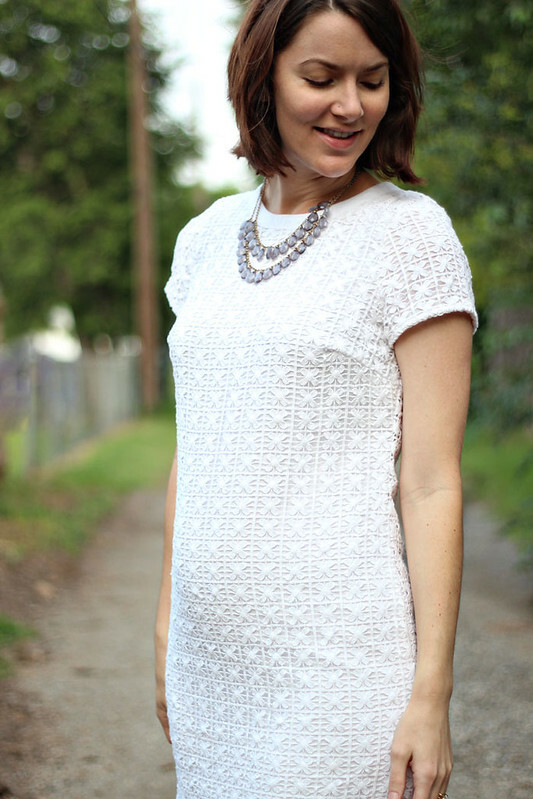 Beautiful crochet LWD for a steal of a price in a classic sheath style and shows off your bump. Love it and you are glowing! Such a cute dress! And your little bump is so adorable! So glad you wondered in and bought this. It looks amazing on your with your adorable bump! such a darling dress! I love the texture to the fabric! great look! omg THAT BUMP. so so cute!!! Ashley, congratulation! :) You look beautiful here, love that dress. I noticed something strange in my pregnancy too, the minute you tell people you are preggers, the bump suddenly grows ten folds! AH! I'm so, so, so behind on catching up on blogs, so I haven't had the chance yet to congratulate you on your pregnancy! SO exciting!!! I am so happy for you :) Your little bump is adorable - I can't wait to see it grow! You definitely needed that dress! Maternity or not, it's adorable and shows off your cute little bump! Your hair looks really fab in these pictures! 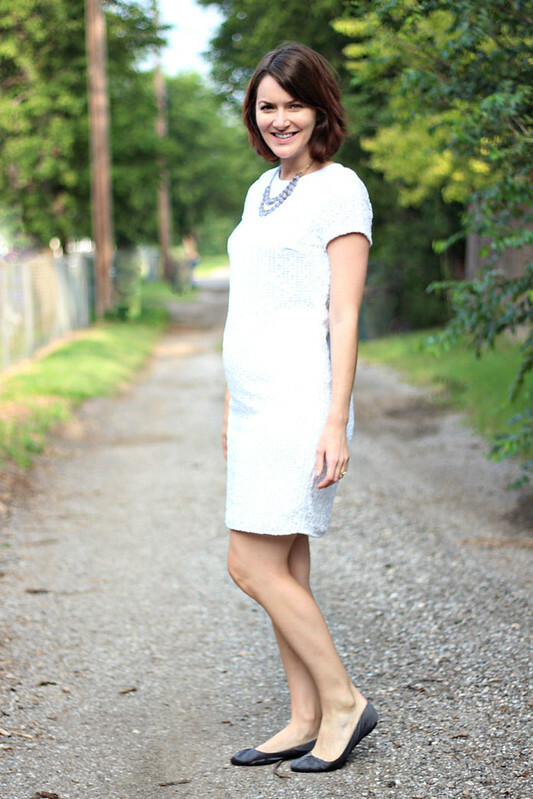 A LWD (of course we know what it means!!) is totally on my list as well. This one is a steal and looks great.